The latest generation of solar cell that utilizes dye from plants as a photosensitizer is Dye-Sensitized Solar Cell (DSSC). The dye from Solanum melongena L. is one of the potential photosensitizers due to its chemical and physical characteristics. This study aims to determine these characteristics as well as its efficiency value in DSSC. The dye was obtained by ultrasonic extraction in 1% HCl methanol solution. The crude extract of dye was treated in acid and basic condition and then separated by vacuum gravitation chromatography in a way that the polarity was increased. The results were a variety of dyes according to their polarity. The dye then applied in DSSC as the photosensitizers. The highest conversion value was 0.0211%, performed by the dye in pH 8 solution. The characteristic of this extract was identified by UV-Vis, FTIR, and GC-MS. All the spectral data indicated that the main component which responsible for this efficiency was pelargonidin. Alhamed, M., Isa, A. S., & Doubal, A. W. (2012). Studying of Natural Dyes Properties as Photo-sensitizer for Dye-Sensitized Solar Cells (DSSC). Journal of Electron Devices, 16, 1370-1383. Andersen, O.M., & Kenneth R. M. (2006). Flavonoids: Chemistry, Biochemistry, and Applications. New York: CRC Press. Baharuddin, A., Aisyah., Saokani, J., & Risnah. I. A. (2015). Karakterisasi Zat Warna Daun Jati (Tectona grandis) Fraksi Metanol: n-Heksana sebagai Photosensitizer pada Dye Sensitized Solar Cell. Chimica et Natura Acta, 3(1), 37-41. Chang, H., & Lo, Y. J. (2010). Pomegranate Leaves and Mulberry Fruit as Natural Sensitizers for Dye-Sensitized Solar Cells. Solar Energy, 84, 1833-1837. Cherepy, N. J., Smestad, G. P., Gratzel, M., & Zhang, J. N. (1997). Ultrafast Electron Injection: Implication for a Photochemical Cell Utilizing an Anthocyanin Dye-Sensitized TiO2 Nanocrystalline Electrode. J. Phys. Chem. B, 101(45), 9342-9351. Chien, C. Y., & Hsu, B. D. (2013). Optimization of The Dye-Sensitized Solar Cell with Anthocyanin as Photosensitizer. Solar Energy, 98, 203-211. Goetzberger, A., & Hoffmann, V. U. (2005). Photovoltaic Solar Energy Generation. New York: Springer. Harborne, J. B. (1973). Photochemical Method: A Guide to Modern Technique of Plant Analysis. London New York: Chapman and Hall. Hug, H., Bader, M., Mair, P., & Glatzel, T. (2014). Biophotovoltaics: Natural Pigments in Dye-Sensitized Solar Cells. Applied Energy, 115, 216-225. Kepala Badan Geologi Kementrian Energi dan Sumber Daya Mineral (ESDM). (2014). tentang Cadangan Minyak di Indonesia Hanya Cukup untuk 23 Tahun Lagi. (www.tribunnews.com). Kosela, S. (2010). 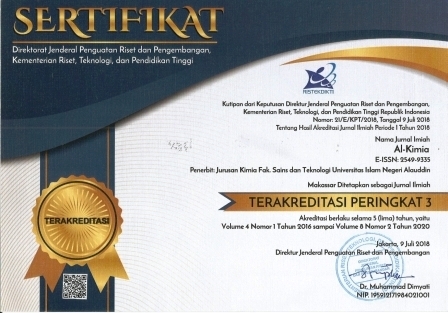 Cara Mudah dan Sederhana Penentuan Struktur Molekul Berdasarkan Spektra Data (NMR, MASS, IR,UV). Jakarta: Lembaga Penerbit Fakultas Ekonomi UI. Maming, M. S., Aisyah., Suriani., & Iswadi. (2017). Photosensitizer dari Fraksi Metanol: n-Heksana Buah Cabe Merah (Capsiccum annum L.). Al-Kimia, 5(1), 31-38. Michael, G., & O’Regan, B. (1991). A Low-Cost, High-Efficiency Solar Cell Based On Dye-Sensitized Colloidal TIO2 Films. Nature, 353, 737-739. Noda, Y., Kneyuki, T., Igarashi, K., Mori, A., & Packer, L. (2000). Antioxidant Activity of Nasunin, An Anthocyanin in Eggplant Peels. Toxicology, 148, 119-123. Sadilova, E., Stintzing, F. C., & Carle, R. (2006). Anthocyanins, Colour and Antioxidant Properties of Eggplant (Solanum melongena L.) and Violet Pepper (Capsicum annum L.) Peel Extracts. Z. Naturforsch C, 61(7-8), 527-535. Wahab, N. H., Aisyah., & Suriani. (2016). Karakterisasi Zat Warna Tomat (Solanum lycopersicum) Fraksi Metanol: n-Heksana sebagai Photosensitizer pada Dye Sensitized Solar Cell. Al-Kimia, 4(2), 43-51. Wongcharee, K., Meeyoo, V., & Chavadej, S. (2007). Dye-Sensitized Solar Cell Using Natural Dyes Extracted from Rosella and Blue Pea Flowers. Solar Energy Materials and Solar Cells, 91(7), 566-571. Zhou, H., Wu, L., Gao, Y., & Ma, T. (2011). Dye-Sensitized Solar Cells using 20 Natural Dyes as Sensitizers. Journal of Photochemistry and Photobiology A: Chemistry, 219(2-3), 188-194.